Mexicolore is a small, independent, specialist, artefact-based teaching team providing in-school visits and teaching resources on Mexico, the Mexica (Aztecs) and the Maya. Since 1980 our living history teams have now made over 3,000 visits to schools, museums, arts centres and hospitals throughout England. 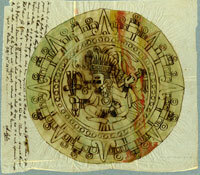 In support of our interactive school workshops on Mexico, the Aztecs* and the Maya, in which over 200,000 children have already participated, this constantly updated, 100% educational website, based in London and established in 2001, offers a wealth of carefully researched information and resources on (ancient) Mexico, all designed to inspire, inform, intrigue and encourage serious students of the Aztecs, the Maya (and ancient Mesoamerica in general) of ALL ages. Note: we receive no funding of any kind and we carry no adverts. We’re fiercely proud of our independence! What links the Beatles to the Aztecs? of the original inhabitants of the Americas? when they captured or killed an enemy? How did commoners address the emperor? How did they address other commoners?